Fourth time for this event and venue and it's starting to do steady business despite it being the evening of Goodyears 21st Anniversary, Wolverley 11th Anniversary and Prestatyn. I was at a family meal earlier in the night so wasn't sure when (and even if) I'd get here and also had tickets for another event at the Night Owl just in case it was late before we left, in the event we made it just after 10 when Steve Glover's set had just started - not as impressive as last time but still some gems in there, stayed for Dave Rimmer when things were starting to get going and people were still arriving, reaching a peak about half eleven. At midnight we nipped over to the Night Owl to see Jo Prinsen DJing, the contrast was pretty stark - the Night Owl was packed and enthusiasm was high but there was no room to dance at all and beer all over the floor; great atmosphere but not one for the serious dancer (or any dancer that needs more than 2 square feet of space) so we returned for the last hour at St Anne's to catch Tony Reynolds again playing an outstanding set of very personal underplayed stuff. As I've said before this venue is really deserving of your support - central location, really top notch DJ's, nice dancefloor, friendly crowd, parking (in Birmingham City Centre!) and cheap drinks (ditto!) what's not to like? 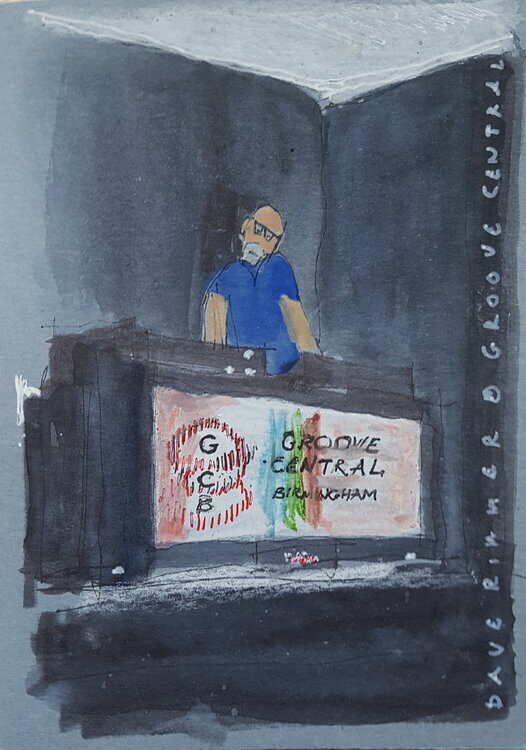 So a patchy night on my part - trying to do three things in one evening but good Birmingham soul events are a bit like buses; none for ages then two arrive at once. More drawings on grey, not a bad postcard of Dave Rimmer either. I rarely give 5 stars - I've noticed most reviews are by the promoters of the events who inevitably give 5 stars to everything. I am trying to be objective.